Many know the passage of John 3:16 that God so loved the world that He gave His only begotten Son and whosoever should believe on His name shall be saved. God extends this power He worked in Christ to those who believe, and wants us to understand and know what the hope of His calling us into His body means as being the church. For as Christians we are part of a church Christ is the head of and sits at the right hand of God and is above all principality, power, might, and dominion all of which no one has ever claimed or ever will. (Ephesians 1:17-23). That the God of our Lord Jesus Christ, the Father of glory, may give unto you the spirit of wisdom and revelation in the knowledge of him: The eyes of your understanding being enlightened; that ye may know what is the hope of his calling, and what the riches of the glory of his inheritance in the saints, And what is the exceeding greatness of his power to us-ward who believe, according to the working of his mighty power, Which he wrought in Christ, when he raised him from the dead, and set him at his own right hand in the heavenly places, Far above all principality, and power, and might, and dominion, and every name that is named, not only in this world, but also in that which is to come: And hath put all things under his feet, and gave him to be the head over all things to the church, Which is his body, the fulness of him that filleth all in all. Jesus extends to us what He has received of His Father, a power that can take down the strongholds in our life and power over the nations that do not keep the works they should have. It is a blessing to overcome on behalf of the one who has called us to His purpose. (Revelation 2:26-29). And he that overcometh, and keepeth my works unto the end, to him will I give power over the nations:And he shall rule them with a rod of iron; as the vessels of a potter shall they be broken to shivers: even as I received of my Father. And I will give him the morning star. 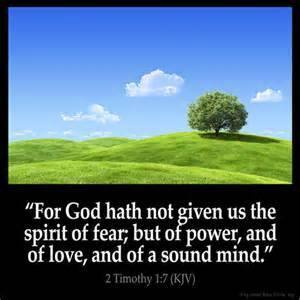 He that hath an ear, let him hear what the Spirit saith unto the churches. Thanks for the scriptures! We are more than conquers through Jesus Christ! Ricardo James…….. Amen! We have all things through Christ our Saviour. God Bless You.